Dr. Anna Smith was the first "Senior Master" Affiliate Fastbraces dentist in the United States. She was the first "Master Affiliate" in the St. Louis area. She was awarded "Top Doctor" worldwide by the inventor of Fastbraces. She is a Fastbraces Technology Instructor and teaches dentists all around the United States about Fastbraces. This year she will be teaching in Houston, Atlanta, Tampa, Chicago, Dallas, New Orleans, Washington DC and Honolulu. You're in great hands with Dr. Smith and her team. Fastbraces® were first introduced about 20 years ago. Since Fastbraces® were introduced, they’ve helped numerous people achieve straighter smiles! Fastbraces® are being used all around the world! Fastbraces® work differently than traditional braces. The technology utilized in Fastbraces® is simply amazing! Fastbraces® decrease the amount of time a patient would have to wear braces by moving both the root and crown of your teeth at the same time. A Fastbraces® patient should experience less discomfort with Fastbraces® than they would with traditional braces. University research shows Fastbraces® cause less sensitivity. Some Fastbraces® patients finish their treatment as quickly as three months, and can be worn by adults, teenagers and children. Dentistry With TLC is the original Fastbraces® office in the Saint Louis, MO area. Of all the Fastbraces® dentists worldwide, Dr. Smith was first awarded “Top Doctor 2011-2012”. At Dentistry With TLC and Fastbraces®, we are ready to help you love your smile again -- maybe even for the first time! Call today to schedule your exam and consultation with the doctor. We can answer any questions you may have. Dr. Smith was awarded “Top Doctor"
Dr. Smith loves providing Fastbraces and she's great at it! She is the only Fastbraces dentist in the world to have earned the prestigious "Fastbraces Legacy" award. 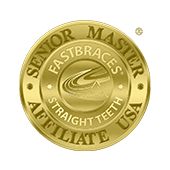 Years ago she became the first "Senior Master" Fastbraces Affiliate in the United States. She was awarded "Top Doctor" worldwide by the inventor of Fastbraces. 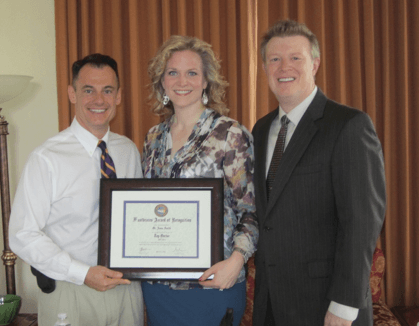 In 2016 Dr. Smith was inducted into the "Speaker's Hall of Fame" for her dedication to teaching hundreds of other dentists all across the United States about Fastbraces technology. Because Fastbraces ® work differently than traditional braces, most people have questions about Fastbraces®. Here are answers to some of the most common questions. Q. How do Fastbraces® work? A. Fastbraces® are designed to do what traditional braces do - only, they can do it faster. Fastbraces® have a unique design that is able to move the top and root of teeth simultaneously. Traditional braces have to move the top and roots in two separate steps, so the process takes longer. A. Fastbraces® are designed to work on most children, teenagers, and adults. A. Anytime you alter the positioning of your teeth - whether you use traditional braces or Fastbraces®, there is going to be some discomfort. However, since Fastbraces® can move the top and root of teeth at the same time, they cause less discomfort than traditional braces. Q. How long does it take to see the result from Fastbraces®? A. Instead of waiting to 2 or 3 years with traditional braces, Fastbraces® can give most people straighter smiles in about a year. In fact, there are plenty of people who have seen remarkable results from their Fastbraces® in just a few months. A. Absolutely! Fastbraces® is the original fast and safe patented braces system developed by Dallas orthodontist, Dr. Anthony Viazis, about 20 years ago when he recognized the patients' desire for braces treatment that could be done fast without the risks that come with the older conventional braces. With safety in mind, Dr. Viazis developed a system that could straighten teeth differently than the conventional braces, thus, allowing for a fast, safe and affordable solution. Don't confuse Fastbraces® with cheap imitations that don’t deliver. A. Fastbraces® gives you a lifetime satisfaction commitment! If, for whatever reason, you need braces again for some of the original crooked teeth, your provider will give you the braces again at no charge. You will simply pay for the future charge for two new sets of clear retainers and records. Q. Can Fastbraces® straighten all of my teeth? A. Absolutely. Fastbraces® addresses the needs of all the teeth, not just the front ones. Fastbraces® is great for kids and adults. It's the full treatment just like the old braces; they simply move the teeth differently in order to finish in about a year. A. Yes, Fastbraces® does offer clear brackets. This option does increase the cost and length of treatment. If interested, please ask your doctor about the clear braces option during your consultation. Q. Do all patients qualify for Fastbraces®? A. Most patients qualify (about 80%). The only conditions that Fastbraces® does not address are teeth stuck in the bone (impacted, surgical (jaw) cases and TMJ (joint) pain as well as some extreme underbites or multidisciplinary (need very specialized treatment) cases. Q. Can Fastbraces® work for adults, too? A. Of course. Fastbraces® are great for kids and adults. Q. Are there any risks at Fastbraces® compared to traditional braces? A. No, there are no more risks of tooth or root problems than those associated with traditional braces. In fact, university research has shown very positive results. We believe this is due to the fact that Fastbraces® moves teeth with the patented braces technology gently with low forces. A special square nickel- titanium wire is activated by the heat of the mouth. It torques the whole tooth in the natural mouth temperature in one stage in about a year and in some cases in just a few months. Q. Why do some people still think that if you move the teeth fast you may damage them? A. Years and years ago with the old conventional braces, the movement of the teeth was very limited and if the doctor tried to tighten the braces more to make the teeth move faster, that would have hurt a lot and possibly even damage the teeth by causing the roots to get shorter (a phenomenon called root resorption ). It's like saying if you ride a horse too fast, you'll kill it from exhaustion. That's true; however, if it's a car and not a horse, then you can go faster than a horse. Fastbraces® is new, patented technology created to move the teeth differently, in order for the movement of the teeth to be safe and affordable. Q. How is Fastbraces® different from other so-called quick systems or even the modern-day traditional braces? A. Fastbraces® is the original, fast and safe braces system developed by Dallas orthodontist Dr. Anthony Viazis about 20 years ago. Fastbraces® moves the root of the teeth from the beginning of treatment in order to upright the tooth in the final straight position. Once the root is upright, the tooth is straight. This is done by using a square wire from the beginning of treatment that torques the root in position. Most other orthodontic braces start with a round wire which cannot torque the root but rather simply begins the alignment of the crowns of the teeth until the doctor can move up in wire size to a square or rectangular wire that can torque the root. Fastbraces® can do that from the beginning. In short, other braces are usually square in shape and typically move the crowns during the first year and the roots during the second year, thus requiring around two years of braces treatment. The patented triangular design of the braces used at Fastbraces® gently allows for movement of the crown and root of the teeth at the same time, requiring typically one year of treatment instead of two.